We just received the newest Moxie Girlz doll, Moxie Girlz Magic Swim Mermaid doll. Being that Baby Digger is just starting to like playing with dolls, this is my first experience with the Moxie Girlz dolls and I think they are super cute. Mermaids are one of the hottest things right now, I see them everywhere and I love all these pretty mermaid dolls they are coming out with and the new Moxie Girlz doll is one of the neatest I’ve seen! The Moxie Girlz Magic Swim Mermaid doll actually swims in water! All you have to do is install 2 AA batteries there’s no on/off switch she magically will start swimming once she’s in the water. She’s really neat and fun to watch, Baby Digger watched in amazement and had a great old time in the tub playing with her Kellan mermaid! She loves to pose her to sit on the edge of the tub and slide her down into the water (okay, I’ll admit I had some fun doing it too!). Not only is the Moxie Girlz magic swim Mermaid lots of fun in the water she’s a very pretty doll! She’s has a cute shiny top and I love her tail too, it’s so pretty and sparkly. Baby Digger loves her and I’m more than sure she’ll be joining her in the swimming pool once summer comes. Moxie Girls Magic Swim Mermaid Avery and Kellan are available at www.amazon.com for $39.99 with Free Super Saver Shipping or at Toys R Us, Walmart, Target or Kmart stores. 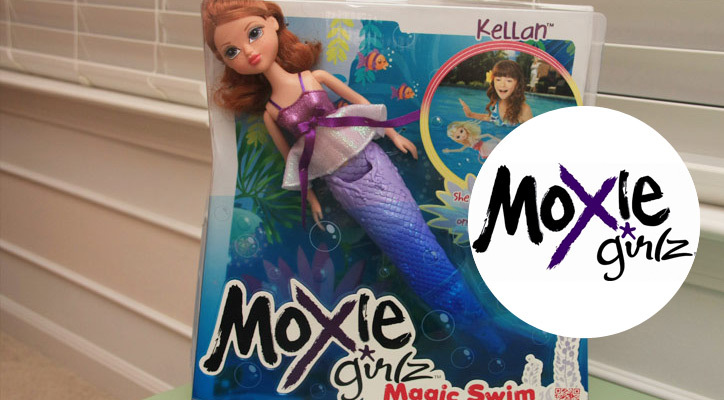 One lucky reader will win a Moxie Girlz Magic Swim Mermaid! To enter fill out the Rafflecopter form below. Ends 4/22 at 11:59PM EST. I received a Moxie Girlz doll for purpose of this honest review. All thoughts and opinions are my own. This post was written by me and not edited by anyone. My daughter is to small for this but my beautiful niece Nicole would love it. She will be 4 yrs old in May. Avery is adorable.